Our OmniTrust Nitrile Powder Free #212 Examination Glove is a thermally activated glove that starts conforming to your hand when donned. You will find our comfort formulation very comfortable, reducing hand fatigue. 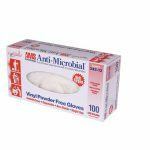 Our OmniTrust Nitrile Powder Free #212 Examination Glove has our famous micro-texture fingertips and matte finish for added grip control without loss of tactile sensitivity. The #212 series is also tested for safe use with chemotherapy drugs.